But what do these targets really mean – how is access defined? Traditionally, energy-access measurements have been split into the ‘haves’ and the ‘have-nots.’ In other words, a household either had a connection to grid-electricity and was considered as having ‘access,’ or it did not. This binary view, however, failed to take into account the reliability of energy services, nor did it consider off-grid sources. Thus, for example, a household using a Solar Home System (SHS) would not be counted as being ‘connected’ despite the fact that a critical set of basic energy needs were being met, whereas a family with a grid connection would be counted as having access, even if black-outs were frequent enough to make it unreliable, or the cost of the electricity made use prohibitive. Recognizing the significant utility off-grid sources can provide, Lighting Africa expanded on this traditional definition of access to include solar lanterns when we began assessing our impact in 2009. Thus, we have been reporting our impacts by determining how many people gained access to modern lighting by multiplying the number of quality-verified solar lanterns sold through our program activities by the region’s average household size of 5 people. This is the calculation commonly used in the industry. But as the roster of off-grid products expands to provide an ever-wider range of energy services, we recognize that counting the impacts of all off-grid products equally may not be the most accurate approach. For example, while a solar task light can provide some degree of access to an entire household, it cannot provide full utility to all members of that household simultaneously, as many SHSs can. In order to address the challenge of defining energy access in this environment of rapid technological development, a multi-tier framework (MTF) was developed with Lighting Africa’s support. The MTF is designed to better measure and communicate actual energy utility – and thereby better pave the way to develop strategies to meet the energy needs of all. The MTF was developed by the World Bank’s SE4ALL Knowledge Hub, with the support of the Energy Sector Management Assistance Program (ESMAP), in partnership and through consultations with multiple SE4ALL stakeholders, including Lighting Africa. 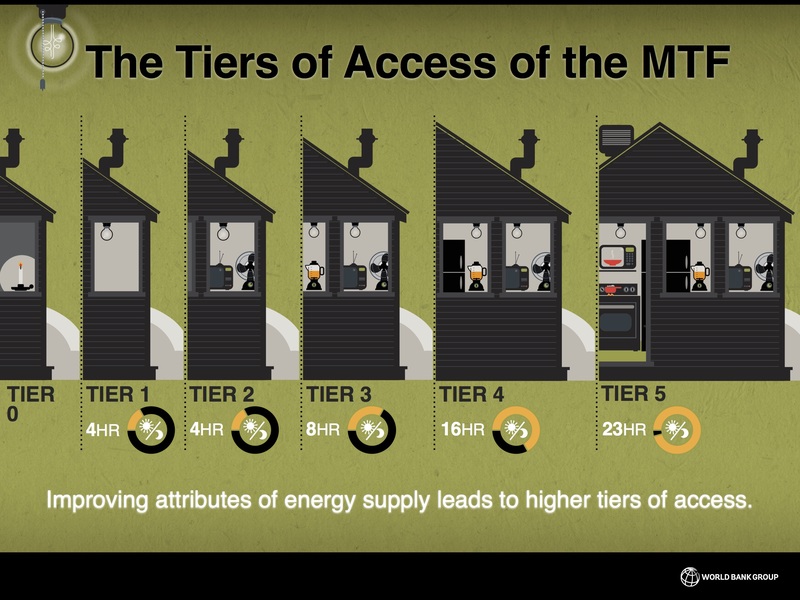 Rather than using a binary lens, the MTF measures energy access as a continuum of services across five tiers. To determine which Tier a household is on, the MTF looks at the quality of the service provided, including its adequacy and availability, reliability, affordability, safety and impact on a user’s health. 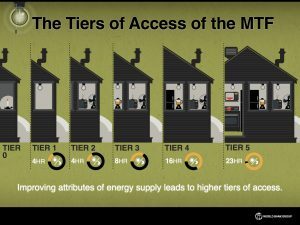 The Tiers range from 0, which means no access to modern energy services of any kind, to Tier 5, which provides reliable, affordable, safe energy services around the clock. And while the ultimate goal would be for all to reach Tier 5, the MTF recognizes that reaching each Tier is a milestone, as each provides important additional benefits. This framework provides a significant contribution to how we can evaluate our impact. According to the MTF, a household that relies on kerosene lamps, candles, and the like to meet its lighting needs – in other words, Lighting Africa’s target population – would be at Tier 0, whereas the off-grid solar products that meet Lighting Global Quality Standards provide up to Tier 2 services. A solar lantern meets Tier 1 on the MTF for a household if it provides at least 1,000 lumen-hours (lmhr) / day and sufficient energy to keep a well-used mobile phone operational. Products that provide less than 1,000 lmhr per day, or do not provide mobile phone charging, are counted as meeting some fraction of a household’s needs. These products are measured at between Tier 0 and Tier 1, depending on their level of services, to evaluate their impact. On the other hand, SHS that provide sufficient general lighting for a household and can also power a television and/or fan reach Tier 2 in the MTF. By using the MTF we can gain more insight into how well people’s needs are being met, and how many people are benefitting from off-grid products. Based on the MTF, Lighting Africa’s program activities have contributed to 15.8 million people in Africa meeting their basic electricity needs (Tier 1) through quality-verified solar products. At the same time, we can report that 59.9 million people have gained access to a quality-verified off-grid solar product due to our activities.Both figures are correct as they are measuring different dimensions of access, which is why you will sometimes see both numbers in our reporting. We are excited to be introducing and sharing this accounting framework, which we had been using only internally to date. By better understanding and defining people’s energy needs, we can better work towards sustainable solutions to meet them. You can read more about the Multi Tier Framework here.